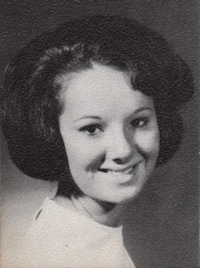 Obituary – Bryant, Deborah Ann (Dolezal) « Perry High School Alumni Association, Inc.
﻿Band Queen 64-65, F. T. A. 62-65, Student Council 63-65, Band 62-65, F. T. A. Secretary 64-65, Student Council President 6465, Junior Play 63-64, Annual Staff 64-65, National Honor Society 63-64, Office 64-65, Band Ensemble 62-63. ﻿Deborah A. (Dolezal) Bryant, 53, passed away January 6, 2001 at a hospital in Austin, TX. She was born Sept 23, 1947 in Stillwater, OK, the daughter of Jim and Sarah Lou Dolezal. She was a graduate of Perry High School and Oklahoma State University. She taught in public schools in Oklahoma. Following her marriage to Gary Bryant they moved to Dallas, TX, where she resided until 2000 when she moved to Austin, TX, to be near her son, Aaron. Survivors include two sons: Chad Bryant and wife Lou, Auckland, New Zealand, and Aaron Bryant, Austin, TX; her parents, Jim and Sarah Lou Dolezal, Perry; one brother, John Dolezal and wife Mary Louise, Perry; aunts and uncles, including Jack and Charlene Dolezal, Perry; and numerous cousins and others relatives. Memorials may be made to the Oklahoma Medical Research Foundation in Oklahoma City.